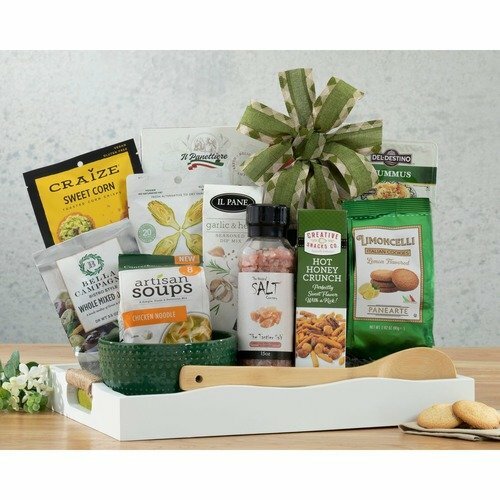 This delicious gift is fun to give and so easy for your recipients to serve and enjoy. 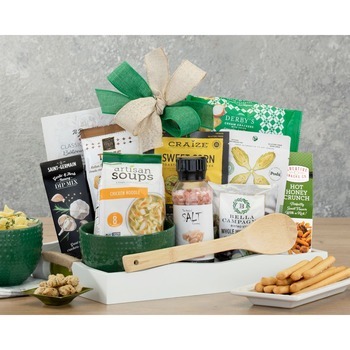 Hearty chicken noodle artisan soup mix with old-fashioned homemade flavor and plenty of noodles will take the chill out of a cold day; spinach and cheese bruschette, hot honey crunch mix, hummus, sesame crackers and lightly salted peanuts are the perfect complements. Two oversized soup bowls and a bamboo soup spoon complete this carefree assortment that will be welcome in any home. * This was my first time ordering from 1st in Flowers. I found it to be user friendly and reasonable. * I have been ordering from 1st in Flowers for several years and always have received excellent service. On the odd occasion I had to change my order at short notice, or a flower in a certain color was not available on the web site, one phone call and everything got sorted! Brilliant! And all recipients were always happy with the flowers they received! I am based in the United Kingdom and 1st in Flowers has always been my 1st choice when sending flowers to my friends.